Yeosu Cable Car. Image by 문화체육관광부. Yeosu is a charming maritime city (pop: 300,000) on the southern coastline of South Korea. Roughly translated from Korean as “good water”, Yeosu is surrounded by 317 islands and is famous for its coastal beauty. Since hosting the 2012 World Expo, it has become a growing tourist destination. To enhance the city’s appeal, the Yeosu Cable Car was built in 2014 by Poma and was estimated to attract one million passengers in its first year. It’s Korea’s first water crossing ropeway and, somewhat surprisingly, Asia’s fourth (Singapore, Hong Kong and Nha Trang have their own respective “seafaring gondolas”). Outside of Korea, the system appears to have had little exposure and attention. However, a quick glance reveals several design elements worthy of further discussion. To begin, the cable car connects two main areas, Jasan Park (Yeosu mainland) and Dolsan Park (Dolsando Island). Jasan Park is a popular sightseeing spot with views of Yeosu Harbour and Odongo Island. It also has a memorial of national hero Yi Sun-sin, one of the world’s greatest naval commanders. The park is opened year round, free. From Jasan Park, the 1.5km long cable car crosses over a small section of Turtle Bridge (photo), before climbing to heights of nearly 100m via two large lattice towers. These tall towers were probably required to allow ships to safely pass beneath because Namhae Sea (Gamack Bay/Yeosu Strait) remains an active port. Aside from technical requirements, the tall towers undoubtedly add to the ride’s overall thrill and excitement. 100m up, passengers enjoy spectacular views of the water, Namhae island and the city. Once arriving at Dolsando Island, visitors are treated to more spectacular vistas of Yeosu city, the coastline and Dolsandaegyo Bridge. The bridge was built in 1984, and is Korea’s longest cable stayed link (450m). Brilliantly illuminated at night, the bridge is a tourism big draw around the clock. It even took a page from a rare ticketing feature we only know exists in the Langkawi Cable Car. That is: “premium cabin tickets” for 5-8 of your friends which allows you can to skip the entire line. Sure it’s capitalistic, but if you have a large group, the US$5 extra per person seems reasonable. It’s unlikely to be used significantly, but a valuable option to have. 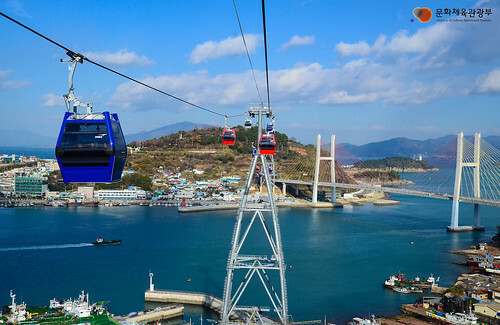 For this rapidly developing nation, the Yeosu cable car appears to satisfy the growing demand for more domestic attractions. Visitors can get to the ropeway by bus and taxi from 9am-10pm (M-F/Sun) and 9am-11pm (Sat).